Senior Cami Drouin-Allaire performs her bar routine during the East Atlantic Gymastics League Championships last month. Gymnastics senior Cami Drouin-Allaire will be the first person in program history to make three appearances in the NCAA Championship. 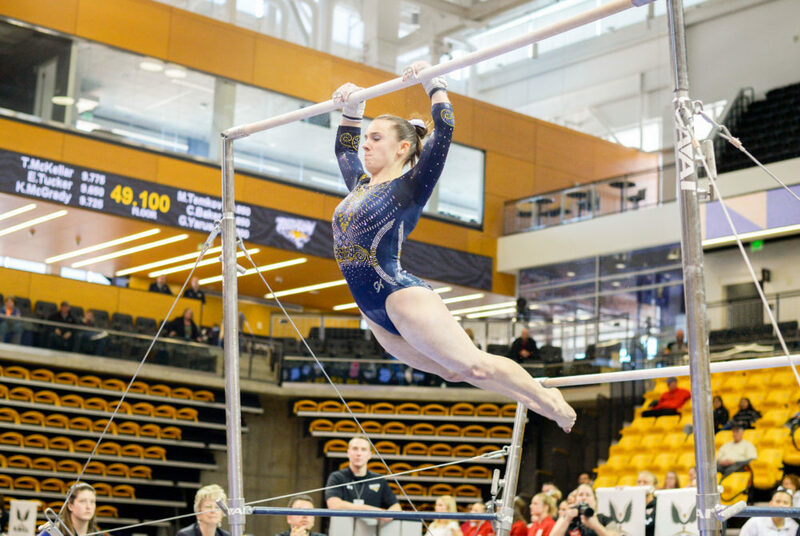 The fourth-year gymnast and Shoreham, N.Y. native qualified for the national event Saturday, when she finished with a 39.275 all-around result at the NCAA Raleigh Regional – 0.075 points higher than her total in the East Atlantic Gymnastics League Championship. Drouin Allaire will be joined by North Carolina senior Morgan Lane, who garnered a 39.325 all-around score and the other spot as a regional all-around qualifier. The two will compete for the national all-around title in St. Louis April 20. Despite Drouin-Allaire’s success, GW finished fifth out of six teams in Raleigh. The Colonials finished with a score of 195.425 – nearly a point lower than GW’s season average heading into the meet. Last year, the Colonials set a program-record postseason score of 195.625 at the regional competition. Foster-Cunningham said the afternoon was a tough battle for the Colonials, who were making their fourth consecutive trip to the regional competition and 14th in program history. The Colonials – who are currently ranked No. 19 in the nation – faced No. 2 LSU, No. 14 Oregon State, No. 31 Maryland, No. 11 Nebraska and No. 20 NC State, who downed the Colonials in the EAGL Championships in March. LSU and Nebraska qualified for the NCAA Championship with team scores of 197.675 and 197.525, respectively. The first and sixth place teams were separated by 2.7 points. Without the services of senior all-around Alex Zois – who has been out of competition since the last meet of the regular season in March – the Colonials called on underclassmen like freshmen Hannah Cohen and Catherine Karpova to fill gaps in the lineup. After sitting out the first rotation on a bye, GW started the meet on the uneven bars. The Colonials performed solid skills on the bars, but form breaks and missed handstands resulted in a number of deductions. Drouin-Allaire led the squad with a score of 9.775, and the team totaled 48.625 on the event. In the third rotation, the Colonials took to the balance beam, where they posted a team score of 48.775. A fall by Cohen forced the Colonials to rely on the rest of their lineup, with seniors Liz Pfeiler and Jill Winstanley posting matching 9.800s. In the fourth rotation, the Colonials scored a 48.900 on floor exercise, anchored by a pair of 9.850s by Drouin-Allaire and senior all-around Madeline Siebold. Karpova stepped into the lineup, posting a serviceable 9.775. Winstanley had an uncharacteristic fall on her last tumbling pass on the floor, forcing her score to drop from the event total and ultimately pushing her out of contention in the all-around competition. The Colonials finished their afternoon on the vault, where Winstanley scored a team-leading 9.900. Despite landing five solid vaults, the team’s meet-high event score of 49.125 was not enough push GW into a contending position.